The offices are feeling empty this week as several of us have gone to the Frankfurt book fair; a very important time of the year for us. They’ll be back next week, no doubt with a full report on everything from the world’s largest book fair. A much-needed volume that brings together ten original papers by the experts, on the relations between Spenser and Shakespeare. There has been much noteworthy work on the linguistic borrowings of Shakespeare from Spenser, but the subject has never before been treated systematically, and the linguistic borrowings lead to broader-scale borrowings and influences which are treated here. An additional feature of the book is that for the first time a large bibliography of previous work is offered. 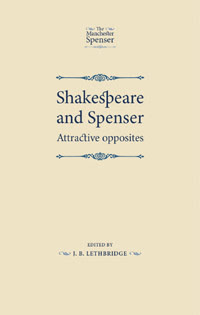 Shakespeare and Spenser presents new approaches, heralding a resurgence of interest in the relations between two of the greatest Renaissance English poets to a wider scholarly group and in a more systematic manner than before. Click on the title for more information, including how to order. 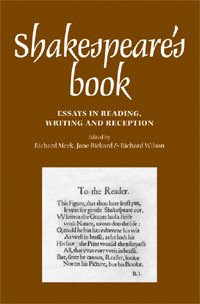 This collection of essays is part of a new phase in Shakespeare studies. The traditional view of Shakespeare is that he was a man of the theatre who showed no interest in the printing of his plays, producing works that are only fully realised in performance. This view has recently been challenged by critics arguing that Shakespeare was a literary ‘poet-playwright’, concerned with his readers as well as his audiences. Shakespeare’s Book offers a vital contribution to this critical debate, and examines its wider implications for how we conceive of Shakespeare and his works. Bringing together an impressive group of international Shakespeare scholars, the volume explores both Shakespeare’s relationship with actual printers, patrons, and readers, and the representation of writing, reading, and print within his works themselves.